WHATEVER ABOUT THE spin Sinn Féin has been putting on elements of the Maíria Cahill story, the party’s longest-serving TD was doing some spin of his own when it came to the opinion polls published yesterday. Caoimhghín Ó Caoláin suggested on RTÉ’s The Week in Politics that the 3 percentage point fall in Sinn Féin support in the Sunday Business Post/Red C poll – from 23 to 20 per cent – is within the margin of error. That may be the case but there is little denying that the Maíria Cahill controversy, unlike recent issues surrounding Sinn Féin and Gerry Adams such as his brother’s abuse or his arrest over the Jean McConville murder, has had a tangible affect on the party’s support. That’s even more evident in the Sunday Times B&A poll which shows that Gerry Adams’s personal satisfaction rating has fallen 7 points to 40 per cent putting him behind Labour’s Joan Burton with the Tánaiste now the country’s most popular party leader. These are by no means catastrophic results for Sinn Féin, but at a time when the party should be capitalising on the unpopularity of the government over water charges it will be disappointing. The result clearly show that the prominence of Cahill and the consistent criticism of Sinn Féin and Adams’s response to her allegations from other parties is having an impact. The question is how much more damaging can it become. In addition, Cahill herself appears in no mood to be silenced, issuing a lengthy and defiant statement last night in response to some reporting around her past connections with the organisation Republic Network for Unity. She restated her original claims about being raped by a member of the IRA and then being subjected to an internal investigation which saw her come face-to-face with her alleged abuser. She also said that in going public with her claims she has been left homeless and in debt. Her continued defiance, willingness to speak out and the efforts of other parties to keep this on the political agenda are likely to ensure that Sinn Féin and Adams will continue to face questions. All of which will be some relief to the government which has seen no political dividend from the ‘giveaway budget’ earlier this month. In fact support for Fine Gael is down 2 points in the Red C poll while Labour is static on 8 per cent with the ‘Burton Bounce’ not as bouncy as we thought. Much of this has to do with the water charges issue that has and is still dogging the coalition. Behind the scenes officials are working on further measures that are set to be announced in the coming weeks that will be aimed at easing the burden on families, particularly those who have children still living at home. Sinn Féin has taken issue with how the media in the Republic have reported the weekend opinion polls. But aside from the cost to consumers, the biggest problem is that Irish Water looks like an incompetent organisation. Worse still, an incompetent organisation where there is a bonus culture. Shedding that image will be hard if nigh on impossible. As for Fianna Fáil, the party will disappointed given that Micheál Martin has sought to do much of the running on the Cahill controversy having been in contact with her for the last two years. An expected bounce in support has not materialised and will continue the grumbles around Martin’s leadership although the lack of any obvious successor means he’s safe. The big winners are again independents and smaller parties. This is perhaps indicative of the anti-political party mood in the country right now. While previously, some of these voters would have gone to Sinn Féin the Cahill controversy and the party’s confusing stance on water charges in the recent by-elections have made independents and the likes of the Anti-Austerity Alliance a more attractive proposition. Whether that will still be the case come the next general election – when people are deciding on a government – remains to be seen. Email “How much more damage can the Maíria Cahill controversy inflict on Sinn Féin? ”. 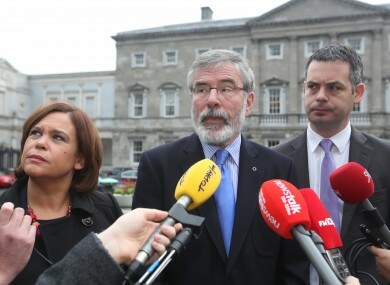 Feedback on “How much more damage can the Maíria Cahill controversy inflict on Sinn Féin? ”.